Ever since Microsoft announced that it was discontinuing support for Windows NT4, Samba users started to ask for detailed instructions on how to migrate from NT4 to Samba-3. This chapter provides background information that should meet these needs. One wonders how many NT4 systems will be left in service by the time you read this book though. Network administrators who want to migrate off a Windows NT4 environment know one thing with certainty. They feel that NT4 has been abandoned, and they want to update. The desire to get off NT4 and to not adopt Windows 200x and Active Directory is driven by a mixture of concerns over complexity, cost, fear of failure, and much more. The migration from NT4 to Samba-3 can involve a number of factors, including migration of data to another server, migration of network environment controls such as group policies, and migration of the users, groups, and machine accounts. It should be pointed out now that it is possible to migrate some systems from a Windows NT4 domain environment to a Samba-3 domain environment. This is certainly not possible in every case. It is possible to just migrate the domain accounts to Samba-3 and then to switch machines, but as a hands-off transition, this is more the exception than the rule. Most systems require some tweaking after migration before an environment that is acceptable for immediate use is obtained. You are about to migrate an MS Windows NT4 domain accounts database to a Samba-3 server. The Samba-3 server is using a passdb backend based on LDAP. The ldapsam is ideal because an LDAP backend can be distributed for use with BDCs generally essential for larger networks. Your objective is to document the process of migrating user and group accounts from several NT4 domains into a single Samba-3 LDAP backend database. The migration process takes a snapshot of information that is stored in the Windows NT4 registry-based accounts database. That information resides in the Security Account Manager (SAM) portion of the NT4 registry under keys called SAM and SECURITY. The Windows NT4 registry keys called SAM and SECURITY are protected so that you cannot view the contents. If you change the security setting to reveal the contents under these hive keys, your Windows NT4 domain is crippled. Do not do this unless you are willing to render your domain controller inoperative. Before commencing an NT4 to Samba-3 migration, you should consider what your objectives are. While in some cases it is possible simply to migrate an NT4 domain to a single Samba-3 server, that may not be a good idea from an administration perspective. Since the process involves going through a certain amount of disruptive activity anyhow, why not take this opportunity to review the structure of the network, how Windows clients are controlled and how they interact with the network environment. MS Windows NT4 was introduced some time around 1996. Many environments in which NT4 was deployed have done little to keep the NT4 server environment up to date with more recent Windows releases, particularly Windows XP Professional. The migration provides opportunity to revise and update roaming profile deployment as well as folder redirection. Given that you must port the greater network configuration of this from the old NT4 server to the new Samba-3 server. Do not forget to validate the security descriptors in the profiles share as well as network logon scripts. Feedback from sites that are migrating to Samba-3 suggests that many are using this as a good time to update desktop systems also. In all, the extra effort should constitute no real disruption to users, but rather, with due diligence and care, should make their network experience a much happier one. Migration of an NT4 domain user and group database to Samba-3 involves a certain strategic element. Many sites have asked for instructions regarding merging of multiple NT4 domains into one Samba-3 LDAP database. It seems that this is viewed as a significant added value compared with the alternative of migration to Windows Server 200x and Active Directory. The diagram in “Schematic Explaining the net rpc vampire Process” illustrates the effect of migration from a Windows NT4 domain to a Samba domain. If you want to merge multiple NT4 domain account databases into one Samba domain, you must now dump the contents of the first migration and edit it as appropriate. Now clean out (remove) the tdbsam backend file (passdb.tdb) or the LDAP database files. You must start each migration with a new database into which you merge your NT4 domains. At this point, you are ready to perform the second migration, following the same steps as for the first. In other words, dump the database, edit it, and then you may merge the dump for the first and second migrations. You must be careful. If you choose to migrate to an LDAP backend, your dump file now contains the full account information, including the domain SID. The domain SID for each of the two NT4 domains will be different. You must choose one and change the domain portion of the account SIDs so that all are the same. If you choose to use a tdbsam (passdb.tdb) backend file, your best choice is to use pdbedit to export the contents of the tdbsam file into an smbpasswd data file. This automatically strips out all domain-specific information, such as logon hours, logon machines, logon script, profile path, as well as the domain SID. The resulting file can be easily merged with other migration attempts (each of which must start with a clean file). It should also be noted that all users who end up in the merged smbpasswd file must have an account in /etc/passwd. The resulting smbpasswd file may be exported or imported into either a tdbsam (passdb.tdb) or an LDAP backend. The merging of multiple Windows NT4-style domains into a single LDAP-backend-based Samba-3 domain may be seen by those who had power over them as a loss of prestige or a loss of power. The imposition of a single domain may even be seen as a threat. So in migrating and merging account databases, be consciously aware of the political fall-out in which you may find yourself entangled when key staff feel a loss of prestige. The best advice that can be given to those who set out to merge NT4 domains into a single Samba-3 domain is to promote (sell) the action as one that reduces costs and delivers greater network interoperability and manageability. From feedback on the Samba mailing lists, it seems that most Windows NT4 migrations to Samba-3 are being performed using a new server or a new installation of a Linux or UNIX server. If you contemplate doing this, please note that the steps that follow in this chapter assume familiarity with the information that has been previously covered in this book. You are particularly encouraged to be familiar with “Secure Office Networking”, “The 500-User Office” and “Making Happy Users”. We present here the steps and example output for two NT4 to Samba-3 domain migrations. The first uses an LDAP-based backend, and the second uses a tdbsam backend. In each case the scripts you specify in the smb.conf file for the add user script collection of parameters are used to effect the addition of accounts into the passdb backend. Before proceeding to NT4 migration using either a tdbsam or ldapsam, it is most strongly recommended to review “Installation of DHCP, DNS, and Samba Control Files” for DNS and DHCP configuration. The importance of correctly functioning name resolution must be recognized. This applies equally for both hostname and NetBIOS names (machine names, computer names, domain names, workgroup names ALL names!). Prepare the target Samba-3 server. This involves configuring Samba-3 for migration to either a tdbsam or an ldapsam backend. Clean up the source NT4 PDC. Delete all accounts that need not be migrated. Delete all files that should not be migrated. Where possible, change NT group names so there are no spaces or uppercase characters. This is important if the target UNIX host insists on POSIX-compliant all lowercase user and group names. Step through the migration process. Remove the NT4 PDC from the network. Upgrade the Samba-3 server from a BDC to a PDC, and validate all account information. It may help to use the above outline as a pre-migration checklist. In this example, the migration is of an NT4 PDC to a Samba-3 PDC with an LDAP backend. The accounts about to be migrated are shown in “View of Accounts in NT4 Domain User Manager”. In this example use is made of the smbldap-tools scripts to add the accounts that are migrated into the ldapsam passdb backend. Four scripts are essential to the migration process. Other scripts will be required for daily management, but these are not critical to migration. The critical scripts are dependant on which passdb backend is being used. Refer to “Samba smb.conf Scripts Essential to Samba Operation” to see which scripts must be provided so that the migration process can complete. Verify that you have correctly specified in the smb.conf file the scripts and arguments that should be passed to them before attempting to perform the account migration. Note also that the deletion scripts must be commented out during migration. These should be uncommented following successful migration of the NT4 Domain accounts. Under absolutely no circumstances should the Samba daemons be started until instructed to do so. Delete the /etc/samba/secrets.tdb file and all Samba control tdb files before commencing the following configuration steps. The UNIX/Linux usermod utility does not permit simple user addition to (or deletion of users from) groups. This is a feature provided by the smbldap-tools scripts. If you want this capability, you must create your own tool to do this. Alternately, you can search the Web to locate a utility called groupmem (by George Kraft) that provides this functionality. The groupmem utility was contributed to the shadow package but has not surfaced in the formal commands provided by Linux distributions (March 2004). The tdbdump utility is a utility that you can build from the Samba source-code tree. Not all Linux binary distributions include this tool. If it is missing from your Linux distribution, you will need to build this yourself or else forgo its use. 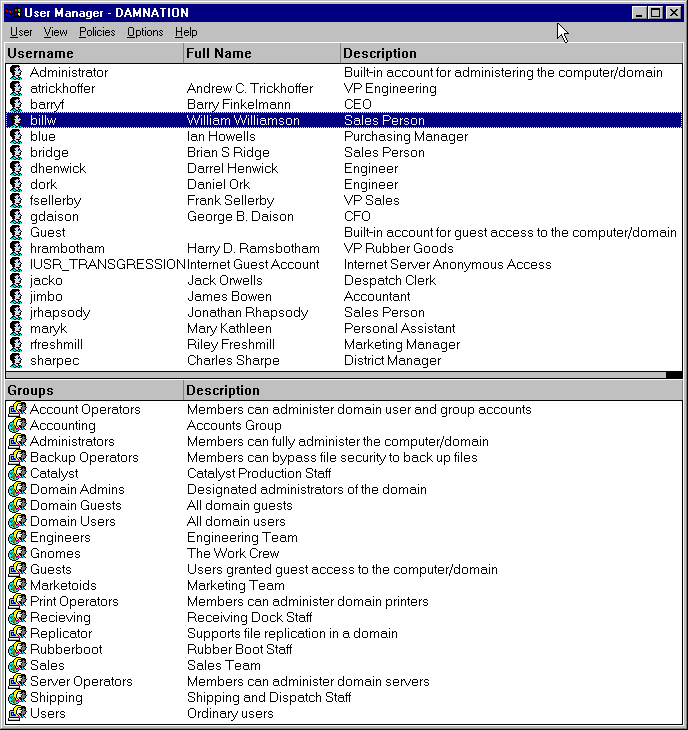 Before starting the migration, all dead accounts were removed from the NT4 domain using the User Manager for Domains. Configure the Samba smb.conf file to create a BDC. An example configuration is given in “NT4 Migration Samba-3 Server smb.conf Part: A”. The delete scripts are commented out so that during the process of migration no account information can be deleted. Configure OpenLDAP in preparation for the migration. An example sladp.conf file is shown in “NT4 Migration LDAP Server Configuration File: /etc/openldap/slapd.conf Part A”. The rootpw value is an encrypted password string that can be obtained by executing the slappasswd command. Install the PADL nss_ldap tool set, then configure the /etc/ldap.conf as shown in “NT4 Migration NSS LDAP File: /etc/ldap.conf”. Edit the /etc/nsswitch.conf file so it has the entries shown in “NT4 Migration NSS Control File: /etc/nsswitch.conf (Stage:1)”. Note that the LDAP entries have been commented out. This is deliberate. If these entries are active (not commented out), and the /etc/ldap.conf file has been configured, when the LDAP server is started, the process of starting the LDAP server will cause LDAP lookups. This causes the LDAP server slapd to hang because it finds port 389 open and therefore cannot gain exclusive control of it. By commenting these entries out, it is possible to avoid this gridlock situation and thus the overall installation and configuration will progress more smoothly. PING transgression.terpstra-world.org (192.168.1.5) 56(84) bytes of data. Do not proceed to the next step if this step fails. It is imperative that the name of the PDC can be resolved to its IP address. If this is broken, fix it.
. if your samba controller is up and running.
. logon path: directory where roaming profiles are stored. Note that the NT4 domain SID that was previously obtained was entered above. Also, the sambaUnixIdPooldn object was specified as sambaDomainName=DAMNATION. This is the location into which the Idealx smbldap-tools store the next available UID/GID information. It is also where Samba stores domain specific information such as the next RID, the SID, and so on. In older version of the smbldap-tools this information was stored in the sambaUnixIdPooldn DIT location cn=NextFreeUnixId. Where smbldap-tools are being upgraded to version 0.9.1 it is appropriate to update this to the new location only if the directory information is also relocated. Edit the /etc/nsswitch.conf file so it has the entries shown in “NT4 Migration NSS Control File: /etc/nsswitch.conf (Stage:2)”. Note that the LDAP entries have now been uncommented. The script tries to add the ou=People container twice, hence the error message. This is expected behavior. In both cases the LDAP accounts follow the “+::0:” entry. Note: During account migration, the Windows Administrator account will not be migrated to the Samba server. These are the expected results for a correctly configured system. Check the vampire log to confirm that only expected errors have been reported. See “Migration Log Validation”. It is of vital importance that the domain SID portions of all group accounts are identical. The final responsibility in the migration process is to create identical shares and printing resources on the new Samba-3 server, copy all data across, set up privileges, and set share and file/directory access controls. Now shut down the old NT4 PDC. Only when the old NT4 PDC and all NT4 BDCs have been shut down can the Samba-3 PDC be started. All workstations should function as they did with the old NT4 PDC. All interdomain trust accounts should remain in place and fully functional. All machine accounts and user logon accounts should also function correctly. The configuration of Samba-3 BDC servers can be accomplished now or at any convenient time in the future. Please refer to the carefully detailed process for doing so is outlined in “Samba-3 BDC Configuration”. The following vampire.log file is typical of a valid migration. In this example, we change the domain name of the NT4 server from DRUGPREP to MEGANET prior to the use of the vampire (migration) tool. This migration process makes use of Linux system tools (like useradd) to add the accounts that are migrated into the UNIX/Linux /etc/passwd and /etc/group databases. These entries must therefore be present, and correct options specified, in your smb.conf file, or else the migration does not work as it should. Prepare a Samba-3 server precisely per the instructions shown in “The 500-User Office”. Set the workgroup name to MEGANET. Edit the smb.conf file to temporarily change the parameter domain master = No so the Samba server functions as a BDC for the purpose of migration. Start Samba as you have done previously. Everything looks well and in order. Edit the smb.conf file to reset the parameter domain master = Yes so the Samba server functions as a PDC for the purpose of migration. Migration of an NT4 PDC database to a Samba-3 PDC is possible. An LDAP backend is a suitable vehicle for NT4 migrations. A tdbsam backend can be used to perform a migration. Multiple NT4 domains can be merged into a single Samba-3 domain. The net Samba-3 domain most likely requires some administration and updating before going live. Why must I start each migration with a clean database? Is it possible to set my domain SID to anything I like? When using a tdbsam passdb backend, why must I have all domain user and group accounts in /etc/passwd and /etc/group? Why did you validate connectivity before attempting migration? How would you merge 10 tdbsam-based domains into an LDAP database? I want to change my domain name after I migrate all accounts from an NT4 domain to a Samba-3 domain. Does it make any sense to migrate the machine accounts in that case? After merging multiple NT4 domains into a Samba-3 domain, I lost all multiple group mappings. Why? How can I reset group membership after loading the account information into the LDAP database? What are the limits or constraints that apply to group names? My Windows NT4 PDC has 323,000 user accounts. How long will it take to migrate them to a Samba-3 LDAP backend system using the vampire process? This is a recommendation that permits the data from each NT4 domain to be kept separate until you are ready to merge them. Also, if you do not start with a clean database, you may find errors due to users or groups from multiple domains having the same name but different SIDs. It is better to permit each migration to complete without undue errors and then to handle the merging of vampired data under proper supervision. Yes, so long as the SID you create has the same structure as an autogenerated SID. The typical SID looks like this: S-1-5-21-XXXXXXXXXX-XXXXXXXXXX-XXXXXXXXXX, where the XXXXXXXXXX can be any number with from 6 to 10 digits. On the other hand, why would you really want to create your own SID? I cannot think of a good reason. You may want to set the SID to one that is already in use somewhere on your network, but that is a little different from straight out creating your own domain SID. Samba-3 must be able to tie all user and group account SIDs to a UNIX UID or GID. Samba does not fabricate the UNIX IDs from thin air, but rather requires them to be located in a suitable place. When migrating a smbpasswd file to an LDAP backend, the UID of each account is taken together with the account information in the /etc/passwd, and both sets of data are used to create the account entry in the LDAP database. If you elect to create the POSIX account also, the entire UNIX account is copied to the LDAP backend. The same occurs with NT groups and UNIX groups. At the conclusion of migration to the LDAP database, the accounts may be removed from the UNIX database files. In short then, all UNIX and Windows networking accounts, both in tdbsam as well as in LDAP, require UIDs/GIDs. Access validation before attempting to migrate NT4 domain accounts helps to pinpoint potential problems that may otherwise affect or impede account migration. I am always mindful of the 4 P's of migration: Planning Prevents Poor Performance. If you have 10 tdbsam Samba domains, there is considerable risk that there are a number of accounts that have the same UNIX identifier (UID/GID). This means that you almost certainly have to edit a lot of data. It would be easiest to dump each database in smbpasswd file format and then manually edit all records to ensure that each has a unique UID. Each file can then be imported a number of ways. You can use the pdbedit tool to affect a transfer from the smbpasswd file to LDAP, or you can migrate them en masse to tdbsam and then to LDAP. The final choice is yours. Just remember to verify all accounts that you have migrated before handing over access to a user. After all, too many users with a bad migration experience may threaten your career. I would recommend not to migrate the machine account. The machine accounts should still work, but there are registry entries on each Windows NT4 and upward client that have a tattoo of the old domain name. If you unjoin the domain and then rejoin the newly renamed Samba-3 domain, you can be certain to avoid this tattooing effect. Samba-3 currently does not implement multiple group membership internally. If you use the Windows NT4 Domain User Manager to manage accounts and you have an LDAP backend, the multiple group membership is stored in the POSIX groups area. If you use either tdbsam or smbpasswd backend, then multiple group membership is handled through the UNIX groups file. When you dump the user accounts, no group account information is provided. When you edit (change) UIDs and GIDs in each file to which you migrated the NT4 Domain data, do not forget to edit the UNIX /etc/passwd and /etc/group information also. That is where the multiple group information is most closely at your fingertips. You can use the NT4 Domain User Manager that can be downloaded from the Microsoft Web site. The installation file is called SRVTOOLS.EXE. A Windows 200x group name can be up to 254 characters long, while in Windows NT4 the group name is limited to 20 characters. Most UNIX systems limit this to 32 characters. Windows groups can contain upper- and lowercase characters, as well as spaces. Many UNIX system do not permit the use of uppercase characters, and some do not permit the space character either. A number of systems (i.e., Linux) work fine with both uppercase and space characters in group names, but the shadow-utils package that provides the group control functions (groupadd, groupmod, groupdel, and so on) do not permit them. Also, a number of UNIX systems management tools enforce their own particular interpretation of the POSIX standards and likewise do not permit uppercase or space characters in group or user account names. You have to experiment with your system to find what its peculiarities are. UNIX UIDs and GIDs on most UNIX systems use an unsigned short or an unsigned integer. Recent Linux kernels support at least a much larger number. On systems that have a 16-bit constraint on UID/GIDs, you would not be able to migrate 323,000 accounts because this number cannot fit into a 16-bit unsigned integer. UNIX/Linux systems that have a 32-bit UID/GID can easily handle this number of accounts. Please check this carefully before you attempt to effect a migration using the vampire process. Migration speed depends much on the processor speed, the network speed, disk I/O capability, and LDAP update overheads. On a dual processor AMD MP1600+ with 1 GB memory that was mirroring LDAP to a second identical system over 1 Gb Ethernet, I was able to migrate around 180 user accounts per minute. Migration would obviously go much faster if LDAP mirroring were turned off during the migration.